Sadly the CCM1200 Digital Cutting Machine is no longer manufactured. However we are able to supply parts and service on this superb machine for many years to come. We offer second user Schleuniger CCM1000/1200 Cut to Length Machines for sale or hire, please contact us regarding availability. This datasheet is for reference only. The CCM1200 Cut to Length Machine will cut many insulations including PVC, Heatshrink, PTFE, Teflon, Rubber and Silicone up to 10mm O.D. and 120mm Wide. 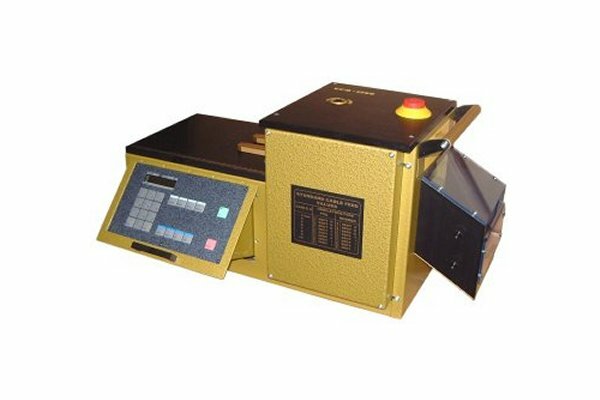 Setup and operation for this Wire Cutting Machine is simple using the integrated keypad to input the cut length, number of pieces and any length correction required. All functions of the CCM1200 Electric Cutter are microprocessor controlled and input data is displayed on an LCD Screen. An operator aid program is included in the control system to assist cable setup. 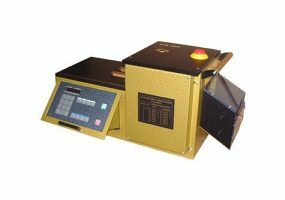 The CCM1200 Electric Cut to Length Machine operates silently at only 56 dBa. For control purposes the first cable to be cut to length is processed by pressing the TEST key. Any deviations from the set value caused by various cable types or method of dereeling can be corrected by the P+ and P- correction keys. Series 4 have serviced and repaired many hundreds of the CCM1200 Cutting Machines that are in daily use in the UK and will continue to do so as we manufacture in the UK quite a few spare parts for this machine.